We love magnets as a learning tool in our house. My son got a great set of animal magnets for his first birthday and they've really helped him learn the names of lots of different kinds of animals. 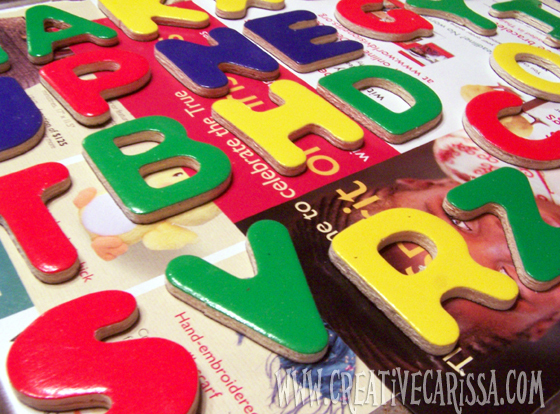 He's beginning his journey into the alphabet so I wanted to get some ABC magnets for him. 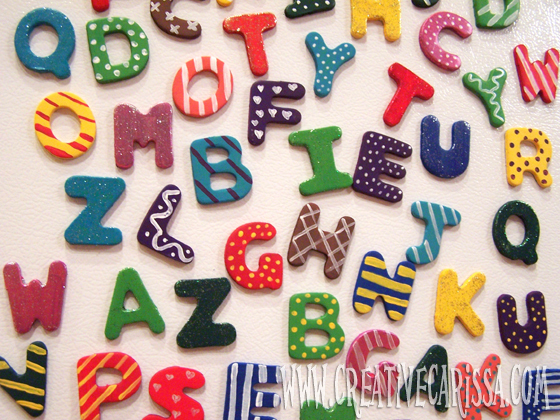 Problem: Many alphabet magnets are plastic and have tiny magnets that fit into that back and pop out and become choking hazards. Also, we just aren't fans of plastic. 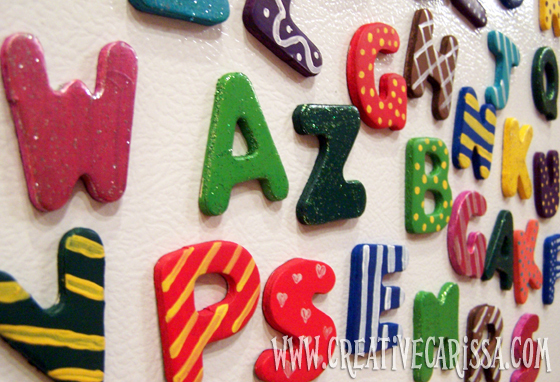 There are a few different great ways you could do this (a quick search of "Alphabet Magnets" on Pinterest turns up lots of fun options). 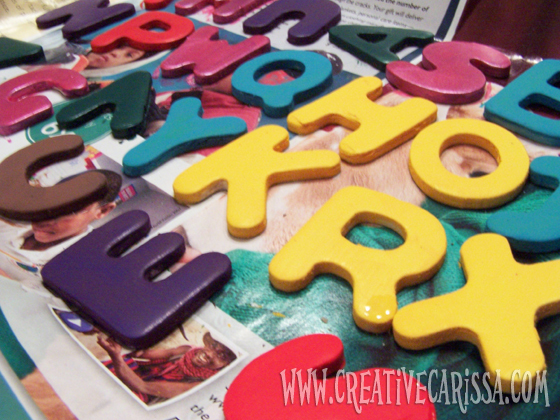 Instead of starting totally from scratch, I decided to get a head start with the alphabet magnets they have at the Dollar Tree (they have number magnets in the same style right now, too!). 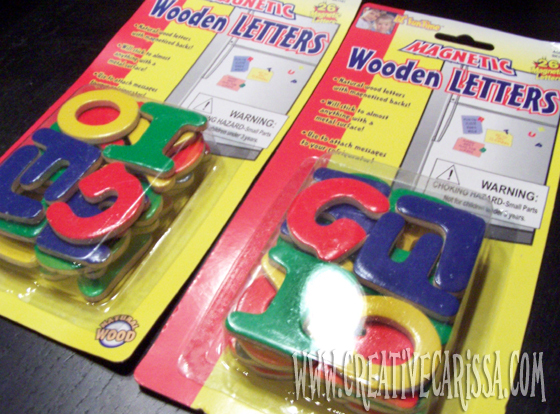 I like these because the magnet covers the full back of each letter and cannot detach. Jazzing them up with paint gave me the opportunity to use more colors and also make them with interesting with patterns. If you have older kids, this would be a fun project to get them involved with...especially if you have tactile learners! Gather your supplies. 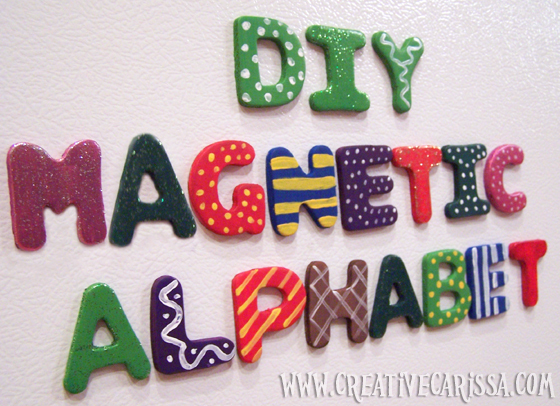 You will need: 2 packs of full back coverage alphabet magnets from Dollar Tree (I got two so I could spell things with double letters) and an assortment of craft paint and paint brushes. You'll also want newspaper or something to cover your work space. Prep the magnets. Cover your workspace in newspaper. The magnets can get a little banged up and dusty from their trip overseas. 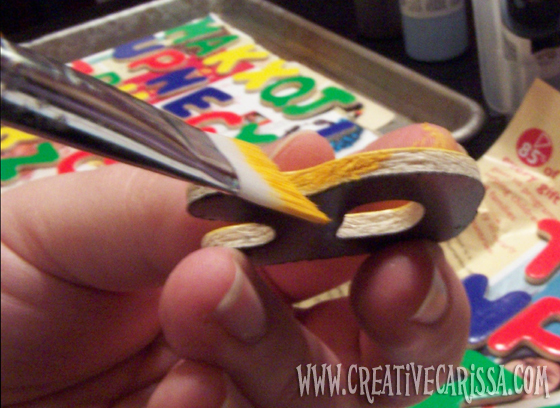 Make sure you wipe them down as you lay them out so that the paint has a nice clean surface to adhere to. Choose your base colors and start painting! The set I bought came in four colors: red, yellow, green and blue. I tried to paint over similar colors (using blue magnets for the ones I wanted to paint purple or yellow magnets for the ones I painted orange, etc) to avoid weird show-through and not needing to use as many coats of paint. I also painted the sides instead of leaving them raw as they came. Add some patterns once the base coats are dry. I used a mix of dots, lines, squiggles, hearts, glitter and more. Really the sky is the limit! 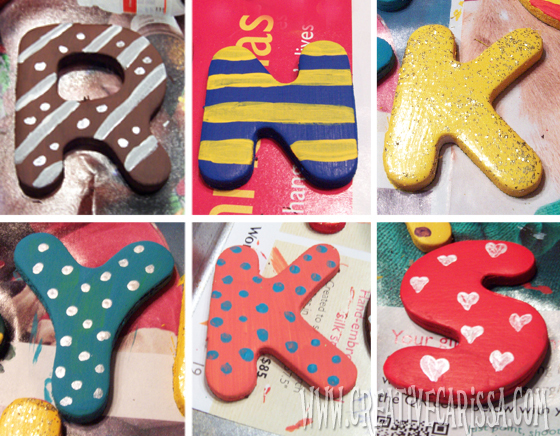 If you want them to all be shiny at the end, you can top them off with a glossy acrylic sealer. That's it! Once they're dry, throw them on the fridge and enjoy!